Last year I showed you a tie being sold at Matalan, which was the right colour combination and a similar design to the St George by Duffer as worn by David in The Day Of The Doctor. 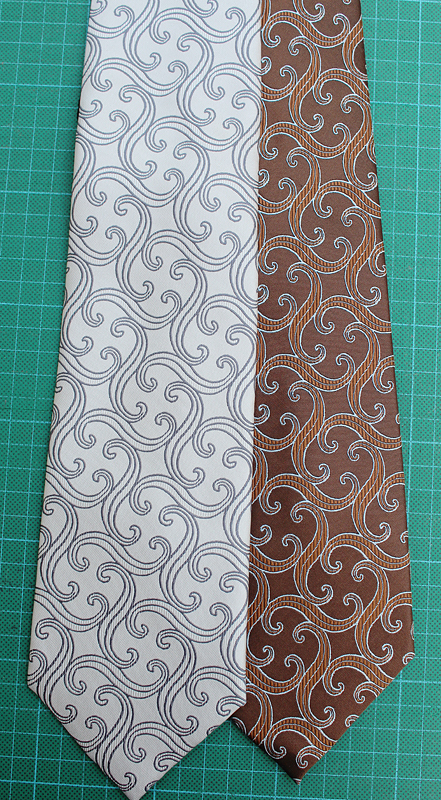 The following month I also came across a tie being sold by Scott Allen which used the exact same loom-weave as the Thomas Nash from The Idiot’s Lantern, but again in a radically different colour way. It was thread-for-thread the same, just in an uninspiring grey and silver. Well today, almost a year the the day later, one of my readers was out shopping and came across something quite surprising. 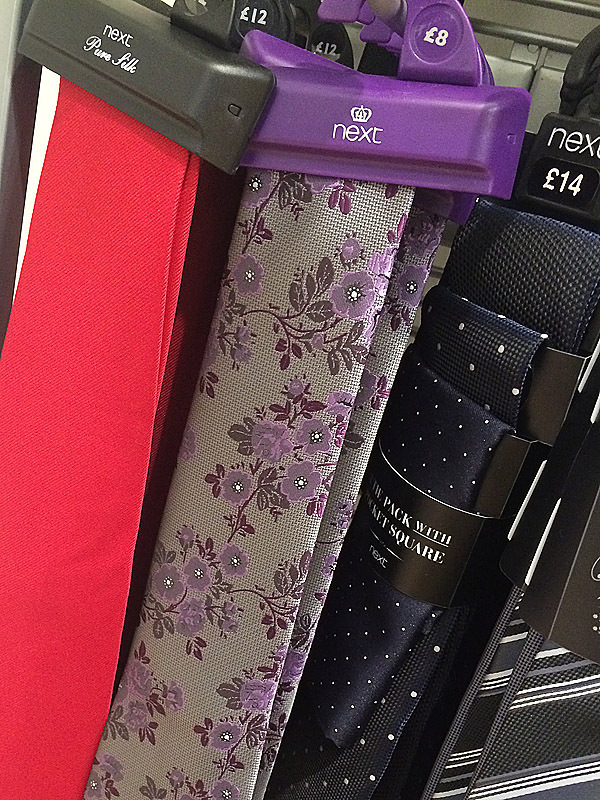 Next are currently stocking a tie which is a dead ringer for The Day Of the Doctor St George by Duffer, but in a striking pink colour scheme! This was spotted in the Portsmouth branch. 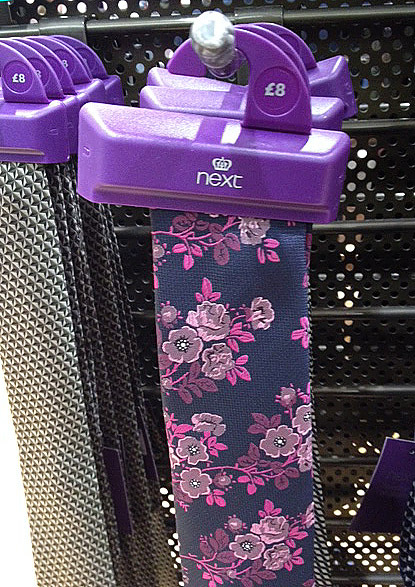 It’s only £8 (compared to the £14 of the original St George tie) with the flowers in pink and lilac on a navy blue background. 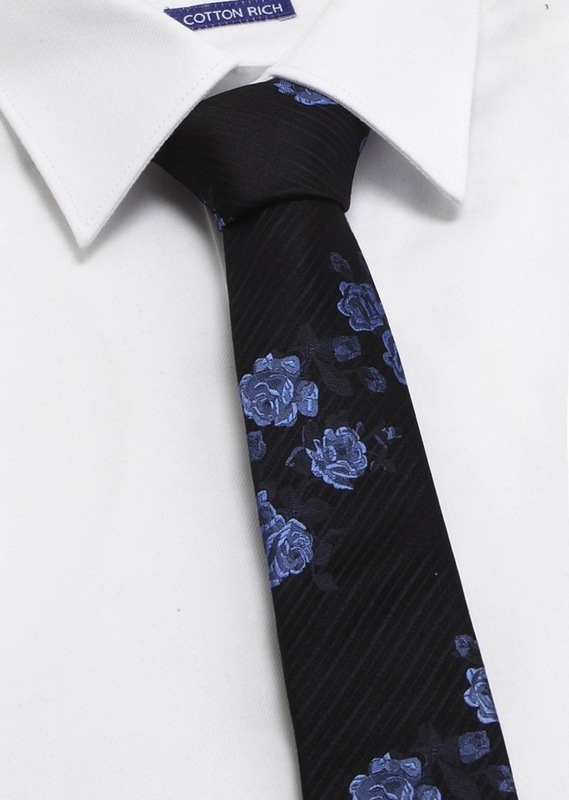 Looking at it closer, the flowers are really reminiscent of the St George tie. I wondered if they did another colour that was closer to, or fingers crossed, the same as screen-worn. So I went into my own local branch and found the tie - in a second colour choice, but still not the dark brown and sky blue. Damn. Once I got it how I put it alongside my St George tie and realised it IS the exact same loom-weave. 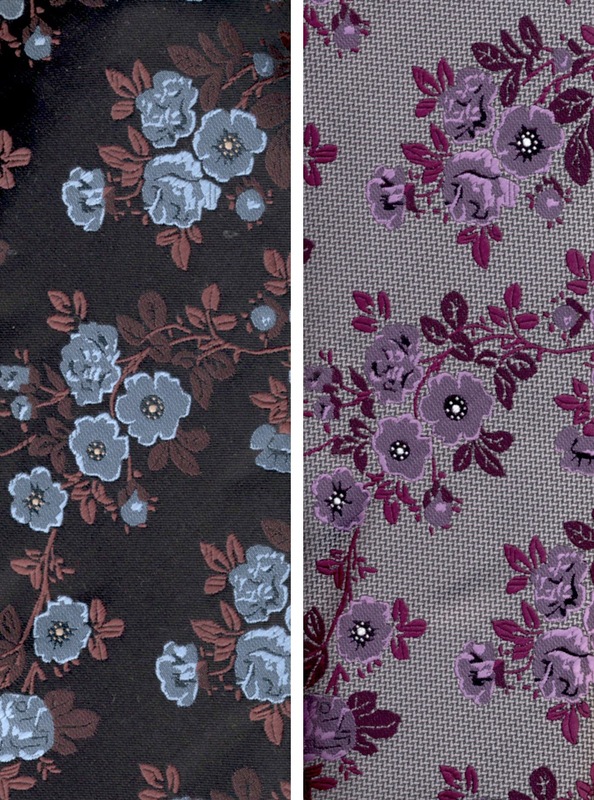 As you can see from these photos, the flowers are IDENTICAL, it is purely the colour choice that differentiates them. This, along with the Scott Allen version of the Thomas Nash tie, makes me think that manufactures in the Far East have designs on their books which they sell to retailers who then choose what colours they want them in. Having now seen two versions, I’m wondering if there are further colour ways. Can you help? and share what you have found. 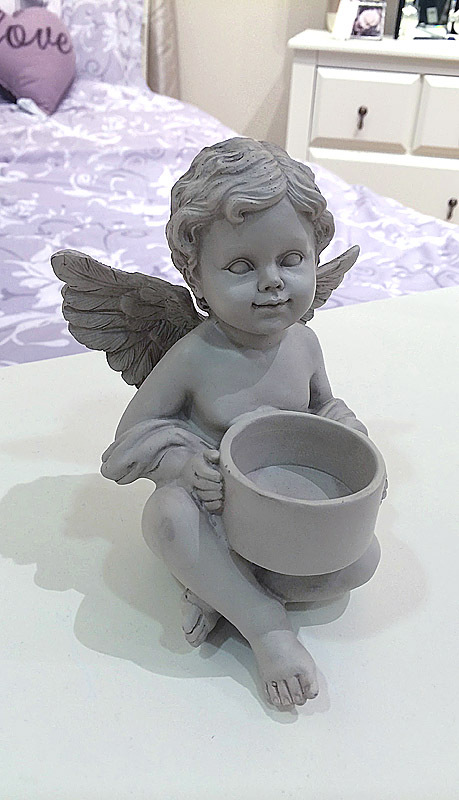 As an aside, I also spotted a rather creepy tea-light holder in the form of a cherub which reminded me of those in The Angels Take Manhattan. 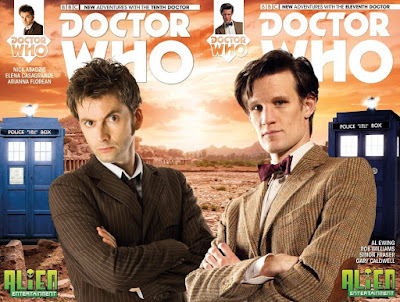 The launch of Titan Comics’ New Adventures With The Tenth Doctor graphic novels series seems to have gone into overdrive, with multiple cover variants to be had. Last month’s San Deigo ComicCon often has convention exclusives, and Titan Comics jumped on the band wagon with not one but two sets are variants. 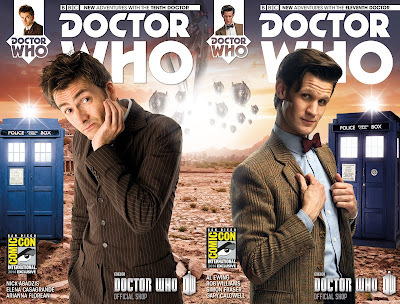 Both versions join with the New Adventures With The Eleventh Doctor to make a single panoramic image. 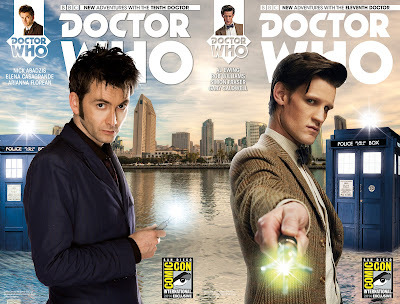 The first variant has The Doctor in his blue suit, worn with the burgundy shirt and Keno tie, wielding his trusty sonic in a pose I haven’t personally seen before. This combination relates to the series four two part story Silence In The Library. 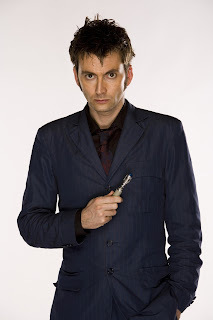 David’s hair seems to match the composites with Alex Kingston as River Song as show here. 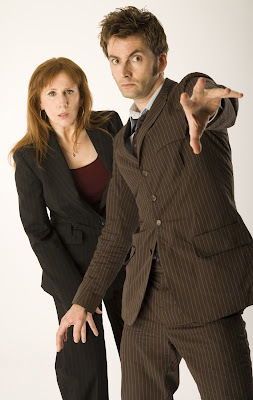 I think the second variant (which was only available at the BBC Shop stand) originates from the photoshoot at the start of series four with Catherine Tate’s Donna Noble. This too is an image I don’t recall being published before - probably due to its pose being so candid in nature. Again, if you look at David’s hair it matches the photo shown here. 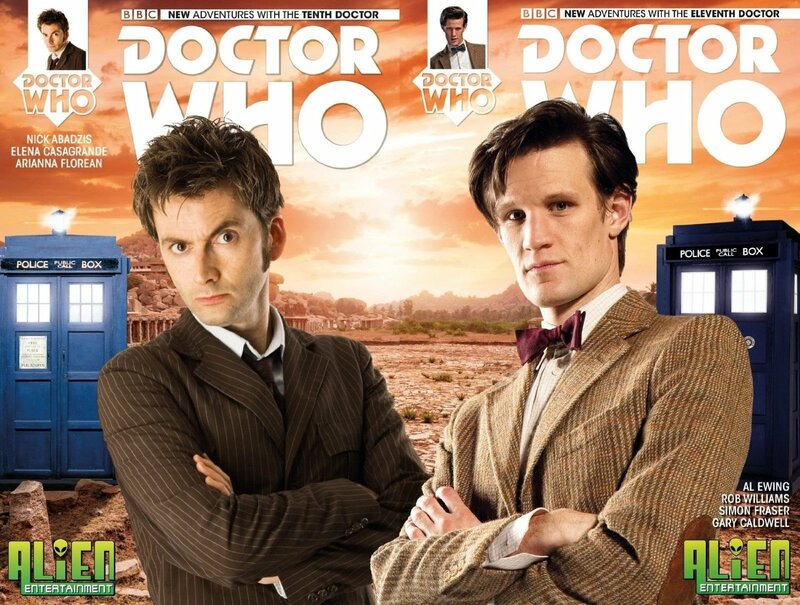 Not to be out done, Forbidden Planet in the UK had their very own variant based on the BBC Shop version. 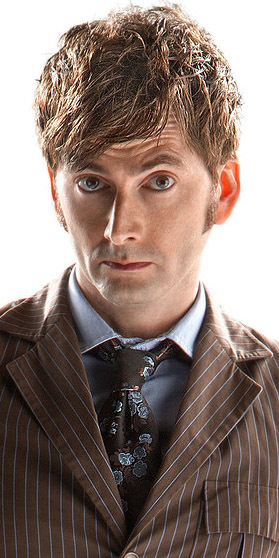 Using the same background, it has yet another previously unpublished image from the series four photoshoot. Note again how David’s hair matches the sample shot above. I was reading some of the Doctor Who news feeds recently, and something caught my eye. As cosplayers we are always on the look out for good quality, unembellished photo reference to get those costume details spot on. The launch of each new series is accompanied by such images, and we pour over them for the insight they give. 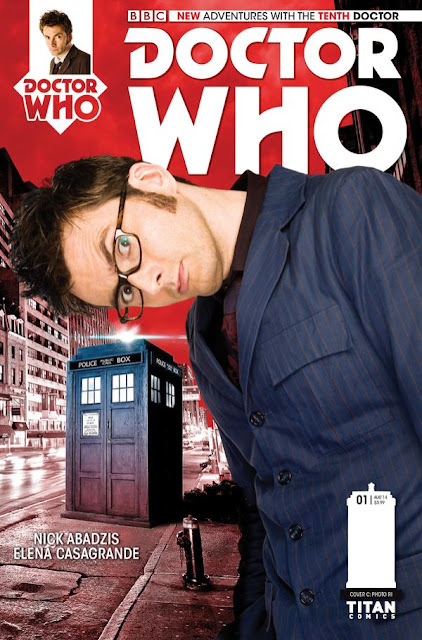 Well, this month Titan Comics are launching a range of New Adventures With The Tenth Doctor graphic novels and the cover of issue one has a real nice image of David in costume - an image I don’t recall seeing before. What we often forget is that for every image we did get to see, there is likely a dozen shots not for public view where the actor isn’t quite looking their best, or the pose just doesn’t fit with what the publicity people want us to see at that time. The first issue has a number of alternative covers, which are all graphic based. 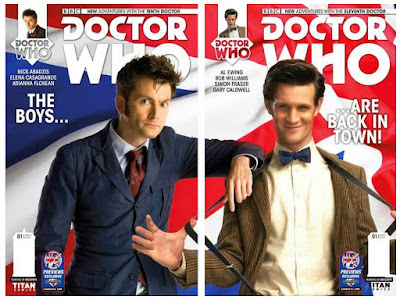 But for one of the covers it seems Titan Comics have gained access to some of these previously unseen photoshoot images. I hope we get some more gems on the coming issues. 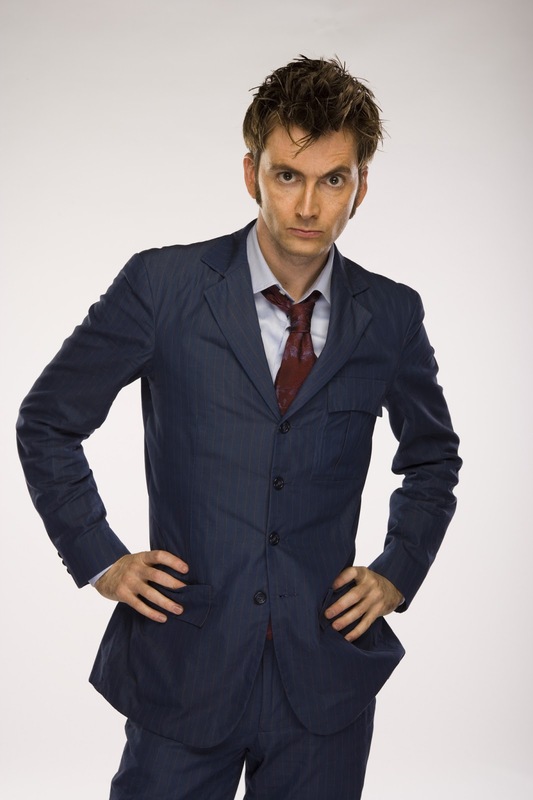 Issue one has an image of David in the blue suit, with the Kenzo tie and burgundy shirt. Aside from the glasses, this matches publicity portraits to accompany the series four two part story, Silence In The Library. He’s in an unusual stance - maybe a little off the wall and not entirely in the style of David’s typical poses as the Tenth Doctor. No sooner has this first issue hit newsstands (and sold out) there is already an exclusive cover variant of the Tenth Doctor conjoining with the Eleventh Doctor to make a single, and very clever image. Remembering that these poses are from photoshoots taken several years apart, they are very cleverly chosen to create what appears to be a single photocall with both actors together. It has you wondering what David was leaning on to get this pose. Again, check out his fringe and how it matches the sample shown here.